With Easter, just around the corner, we can't help but see egg shapes everywhere! Celebrated as one of the most durable and efficient forms found in nature, the egg has served as design inspiration for projects far and wide. 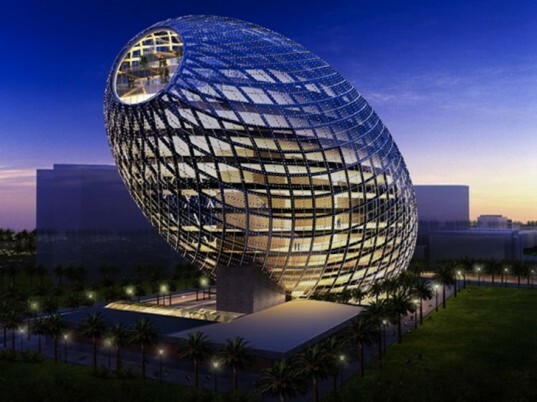 To take advantage of our temporary eggs-ray vision, we've rounded up some of our favorite egg-shaped building designs from all around the world. Hit the jump to see some great projects from architects who share an appreciation for the quirky ovoid form. Josef Stöger’s winding timber walkway isn’t just in the shape of an egg—it’s also the longest treetop walk in the world! Located in Germany’s Bavarian Forest National Park, this treetop walk wraps around three enormous fir trees. At the top, diligent visitors are treated to stunning views of the Bavarian mountains. See more pictures! All Easter Eggs contain treats, with some tastier than others. 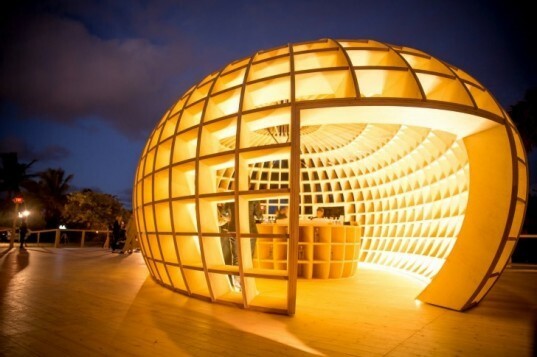 The artistic duo Los Carptineros installed a bar inside Güiro, a gridded ovoid structure built for the 2012 Art Basel at Miami Beach. Inspired by the eponymous Cuban percussion instrument made from dried tropical fruit, Güiro is illuminated from the inside to create an ethereal glowing effect. See more pictures! Designed as one of Berlin’s most symbolically important institutions, this four-level ovoid library designed by Foster + Partners looks like a beautifully checkered egg shell embedded into the landscape. Nicknamed the Berlin Brain, the curved steel and glass building houses over 700,000 books. The staggered glass openings allow for natural ventilation and shading to help manage temperature and daylight. See more pictures! James Law Cybertecture’s future-forward ovoid designs are nothing short of fantastical. Crafted like a beautiful glass Fabergé egg, this conceptual building is said to combine “iconic architecture, environmental design, intelligent systems, and new engineering to create an awe-inspiring landmark in the city”. Solar panels and wind turbines top the structure to provide electricity for the whole site. See more pictures! Have you ever wondered what it might feel like to emerge from an egg like a baby chick? This cute egg-shaped pod might come closest to replicating that experience. Constructed from a timber frame overlaid with stretchy material and polyester, the blob vB3 is a minimalist mobile dream home come true. See more pictures! 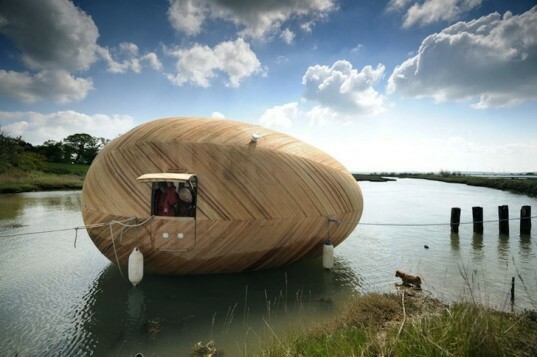 The Exbury Egg is an ovoid house boat built as an experiment in off-grid, low impact living. 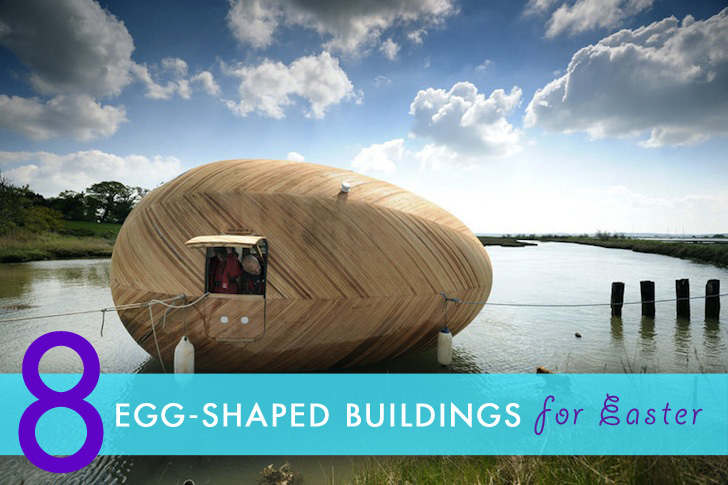 Created by SPUD in collaboration with Perring Architecture + Design, boat builder Paul Baker, naval architect Stephen Payne, and artist Stephen Turner, the temporary timber floating egg was constructed to be both energy-efficient and self-sustaining. See more pictures! 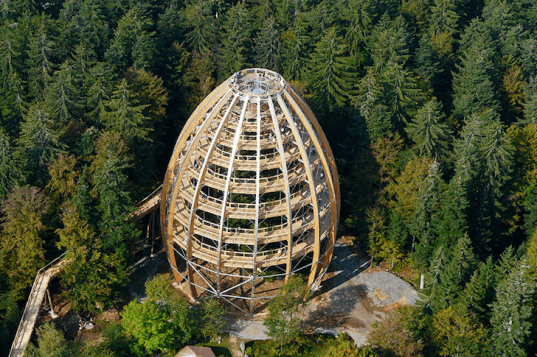 This adorable egg-shaped Hemloft is one of our favorite treehouses on Inhabitat. Mostly built from recycled materials, the Hemloft wraps around a single tree in the quiet backwoods in Whistler, B.C. In addition to its lovely design, this amazing little treehouse also has a fascinating backstory to boot. Read the story! 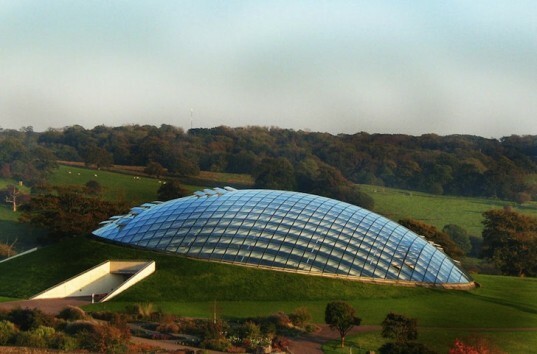 Foster + Partners’ affinity for the egg shape makes another appearance in the United Kingdom’s Garden of Wales Botanical Gardens. Sheathed in a curving glazed facade, this energy-optimizing glass house is partially sunken in the landscape. Scale-like glazed windows flip open to maintain optimal levels of temperature, humidity, and air movement. See more pictures! Josef Stöger's winding timber walkway isn't just in the shape of an egg--it's also the longest treetop walk in the world! Located in Germany's Bavarian Forest National Park, this treetop walk wraps around three enormous fir trees. At the top, diligent visitors are treated to stunning views of the Bavarian mountains. See more pictures! Designed as one of Berlin's most symbolically important institutions, this four-level ovoid library designed by Foster + Partners looks like a beautifully checkered egg shell embedded into the landscape. 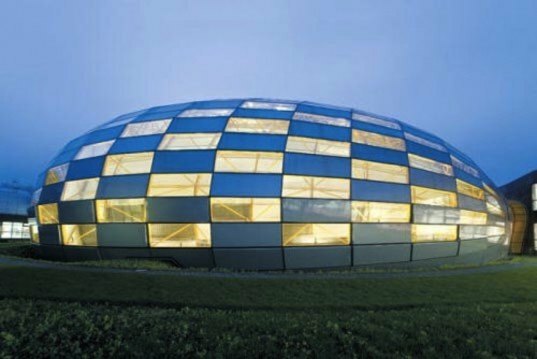 Nicknamed the Berlin Brain, the curved steel and glass building houses over 700,000 books. The staggered glass openings allow for natural ventilation and shading to help manage temperature and daylight. See more pictures! James Law Cybertecture's future-forward ovoid designs are nothing short of fantastical. Crafted like a beautiful glass Fabergé egg, this conceptual building is said to combine "iconic architecture, environmental design, intelligent systems, and new engineering to create an awe-inspiring landmark in the city." Solar panels and wind turbines top the structure to provide electricity for the whole site. See more pictures! Have you ever wondered what it might feel like to emerge from an egg like a baby chick? This cute egg-shaped pod might come closest to replicating that experience! Constructed from a timber frame overlaid with stretchy material and polyester, the blob vB3 is a minimalist mobile dream home come true. See more pictures! 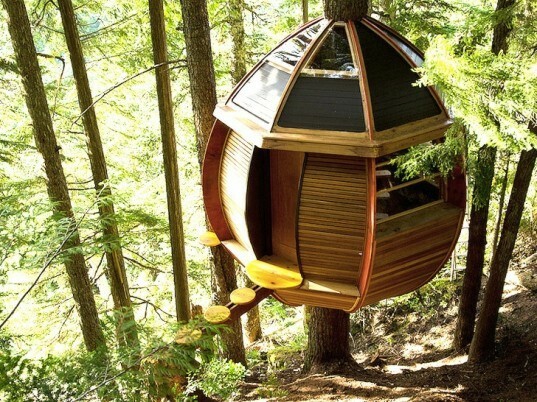 This adorable egg-shaped Hemloft is one of our favorite treehouses on Inhabitat. Mostly built from recycled materials, the Hemloft wraps around a single tree in the quiet backwoods in Whistler, B.C. In addition to its lovely design, this amazing little treehouse also has a fascinating backstory to boot! Read the story! Foster + Partners' affinity for the egg shape makes another appearance in the United Kingdom's Garden of Wales Botanical Gardens. Sheathed in a curving glazed facade, this energy-optimizing glass house is partially sunken in the landscape. Scale-like glazed windows flip open to maintain optimal levels of temperature, humidity, and air movement. See more pictures!